A simple vegetable stir fry with the side of fish curry and rice was a common affair in my house during lunch. Most of the time this vegetable comes from my Mom's kitchen garden or sometimes from my grandparents' house. The freshly picked vegetable made all the difference in a simple stir fry. I remember the ivy gourd plant that climbed the curry leaf tree in my grandparents' house. The huge curry leaf tree and the ivy gourd plant jelled together as if they were grafted together. It was a one stop spot for our neighbors and for us to get ivy gourd and curry leaves. Ivy gourd stir fry was so common in our lunch box those days and I always had a special liking for it. Later that curry leaf tree was chopped when the house was renovated :(. Following the tradition, I always find it easy to include a vegetable with a Keralite meal in the form of stir fry/mezhukkupuratti. There are some vegetable my kids love, no matter how you cook it. One among them in Broccoli. So transforming the super healthy Broccoli to an Indian style stir fry is a simple trick I follow to make my job easier and make the kids happy. This is my Mom's recipe and the only alteration I made to the recipe is the addition of some curry leaves to give more Keralite flavor. You can skip the curry leaf if you cannot find it. But this is a simple, healthy and delicious stir fry that any novice cook can try. Broccoli is rich in anti-inflammatory nutrients, antioxidant nutrients, detox-support nutrients and anti-cancer nutrients. 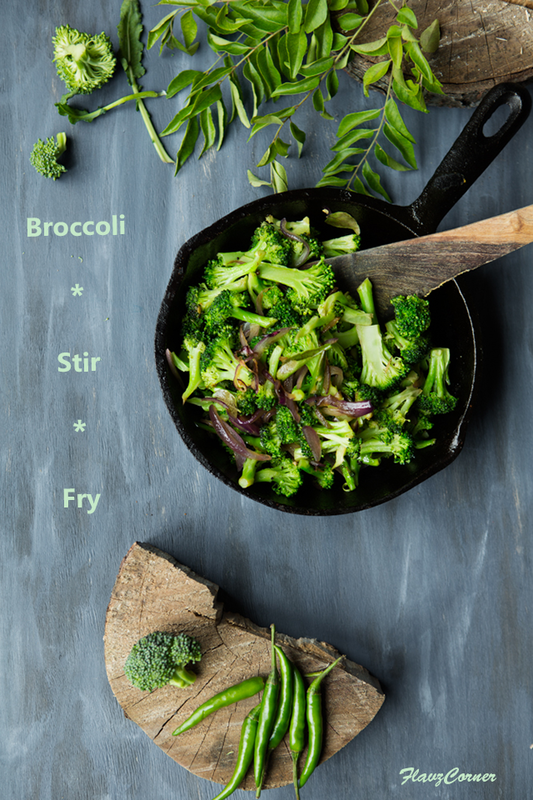 The high fiber content in Broccoli provides excellent digestive support to the body. The anti-inflammatory properties of Sulforaphane found in Broccoli provides Cardiovascular support and lowers cholesterol. They also provide eye and skin health. 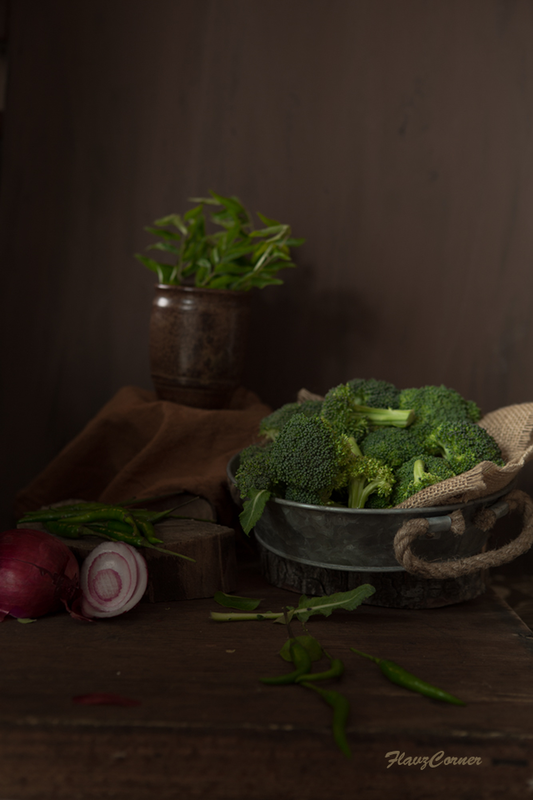 The Vitamin K and Vitamin A rich vegetable aids the metabolism of Vitamin D.
Wash the broccoli florets; strain and separate into small florets. Heat a cast iron or non-stick pan. Splutter 1/4 tsp of mustard seeds in 2 tsp of oil. Add the garlic and onions and saute for 30 seconds. Then add the broccoli and green chili. Sprinkle salt and mix well. Cover with a lid and turn the heat to medium. Cook for 2 minutes. Remove the lid and mix. Cover and cook for another 2 minutes. Remove the lid; add the curry leaves and mix well and cook for 1 more minute. Add the coconut oil and turn off the flame. 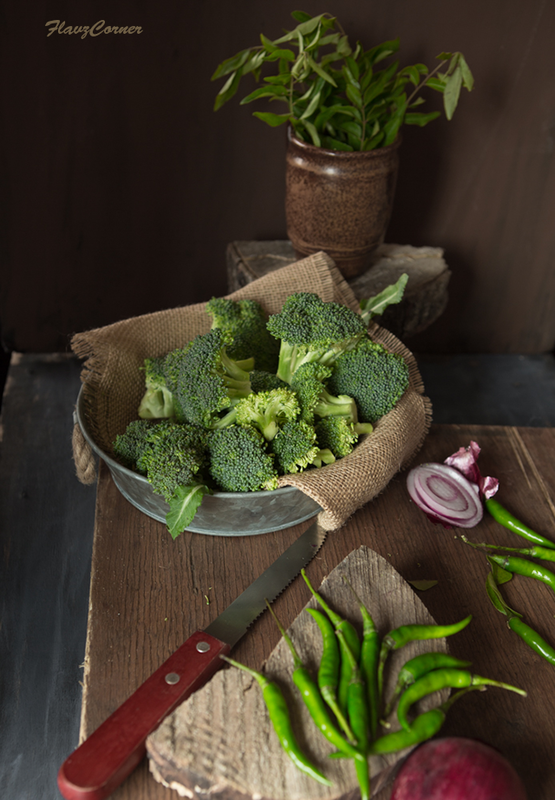 Enjoy the broccoli stir fry with plain steamed rice or Indian flat bread like Roti or Chapathi. Over cooking the broccoli will lose its color and nutrition. So make sure you don't cook it over 5-6 minutes. 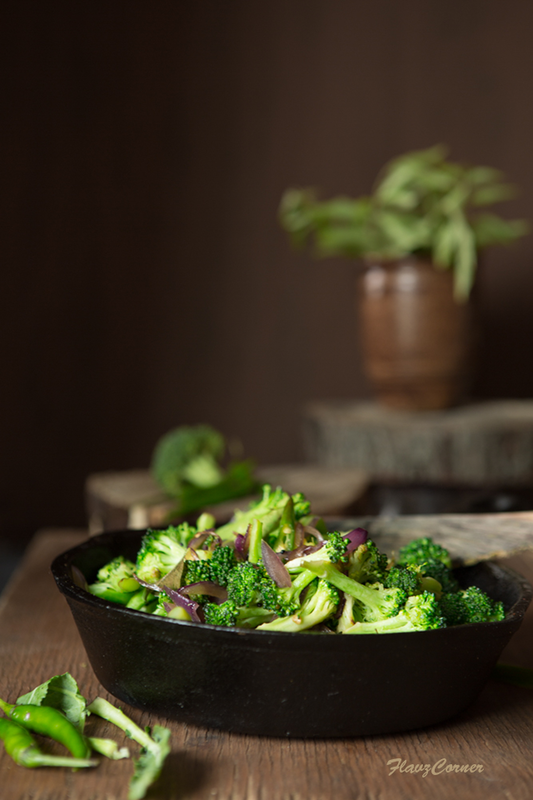 Using a cast iron pan provides uniform heat and helps the broccoli to cook faster. Delicious! I love the simplicity of this stirfry. Love the flavor of black mustard seed! And love this nice, simple dish -- easy, but loaded with flavor. My kind of recipe -- thanks so much.